It’s not difficult to explain the enduring fascination of Gunther von Hagen’s Body Worlds exhibits. Using a technique called Plastination—a strange, exciting innovation in the field of anatomical preservation—the good scientist has erected a gallery of authentic human specimens arranged in lifelike stances of action or repose, with every fleshly layer of skin and muscle peeled away to invite our rapacious curiosity. It’s an attraction fuelled by equal parts genuine inquisitiveness, a kind of “post-beauty” aesthetic appreciation of the human form, and the gory spectacle of the Grand Guignol; a horrific memento mori of the flesh, with rank upon rank of desiccated cadavers reminding us what we are. But it’s not all hyperbolic horror throughout Andrusyshyn’s book, the fear that inspires the admission “I bolt up in my bed / feel myself beneath the covers, / the flesh that hangs and drags its feet” (“The Science of Not Eating”). The sadness of Mammoth is tastefully measured; its existential resignations complemented by a limitless desire to name, categorize, track and deconstruct. The death of the narrator’s father forms the emotional and thematic centrepiece of the collection, the core about which both mortal trembling and scientific marvelling may exchange places. Faced with a wholly material, post-Darwinian world, curiosity and wonder take up where sadness leaves us stranded. Andrusyshyn handles her father’s absence in mature fashion, engaging with his presence/absence in elliptical and surprising ways. He is the spectre haunting the work, at hand and peripheral, variously appearing in the gaze of animals, the choreography of mathematics or the role of unnamed terminal patients languishing in hospitals, surrounded by family and friends stricken dumb by their uselessness. The narrator invokes the Mammoth, that tremendous and absurd and most importantly extinct creature, to gesture toward the passing of bodies, the transference of genetic material (“the hand-me-down accessory / we bury deep” (“Amnesia”)), and the hopelessness of reclaiming the past (in the poem “In Which the Mammoth Goes to School,” the Mammoth decides to map the probabilities of intelligent life in the universe; how sad and useless!). In other poems, various organs—heart, kidneys, stomach—personify a list of inadequacies and failures (the liver, in particular, appears as a poet at an open mic reading: all bile and nervousness, sickly fear). The narrator keeps her analytical eye upon all of this reduction: taking apart, monitoring, studying. “I have a collection of dead things,” says the speaker of “On the Saguenay.” We can only assume that through the lens of science, the spiritual shattering of pure materialism can be perhaps reconstituted. “I’ll collect the pieces,” the speaker tells us, pledging to reconstruct some concept of coherence or order. But in a world where her father “is a code, a genome, in a language of four letters: / adenine, guanine, cytosine, thymine” (“Where the Dead Things Are”), such attempts seem as cold and inhuman as some distant ice age. Such are the book’s thematic concerns; to go further would be to explain too much story. Turning to issues of craft and delivery—the structure and syntax of individual poems, separated from the consecrating binds of the physical product—fills me with conflicting emotions. Allow me a short digression. I hesitate to use the word “project” to describe Andrusyshyn’s work, for reasons I will soon outline. Even if it is, one might plausibly interpret her narrative consistency as a strong point. Mammoth reads, cover to cover, as if abiding by a single totalizing vision. Poems that may have worked against this all-abiding theme (assuming Andrusyshyn wrote other kinds of poems during the book’s composition) have been presumably excised. We might consider the work a project, an essay or a novel. And such unity demands a content-driven investigation in order to be fair to the author’s intentions. Digression over. 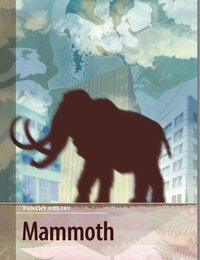 Mammoth’s poems are informal (as in, lacking any recognizable metre, patterned stanzas or ambitious structures), fairly conversational (avoiding any rhythmic or syntactical uncommonness) and entirely accessible, offering little resistance to casual or commuter-style readings. Nothing formally or thematically experimental, to be sure, but Andrusyshyn is obviously comfortable working in this very free tradition (despite Eliot’s reminder that “no verse is free”); she has a voice, and will no doubt continue to refine and perfect it. One forgets the style and shape of the poems while reading; the content demands the attention in such a way as to eliminate visual and tonal concerns. I am guessing, however, that this may change in a subsequent collection, for a more concerned attention to style and structure would no doubt strengthen these already strong offerings. The nurse lists carcinogens like a sportscaster. like data entry in Scarborough. and begin talking in his ear. A poem that would otherwise risk a kind of blandness leaps into an arresting and creepy universe. In “Your Kidneys,” two mopey and stubborn kidneys, listing all the reckless ways stupid and overindulgent people abuse their organs, become slightly repetitive in their complaints until they add, “And life is everywhere,” which is a line so unlike Andrusyshyn’s typical statements that it makes the poem spiral out of expectation and sameness. Certain moments throb with surprise and pathos. In “The Heart Attack,” an elevator repairman suffers the eponymous malady while at work. Rather than describe the physical ache of the blockage (for we are immersed in the physical cough and collapse of bodies), the narrator shifts into the emotive: “in the long strange silence” after the attack, the repairman “becomes sad, succumbs / like the elephant does as he is led to a stool / and is told to stand there in a brightly colored hat.” These are beautiful moments, and delivered well by Andrusyshyn’s conversational tone. Now, some friendly criticisms. Such a casual tone (at times) asks for some pruning and sharpening. In “Vancouver Aquarium,” for example, I would strike a number of articles and prepositions. “The trees hang over the basin” seems much stronger as “Trees hang over the basin”; “slid the bolt across” can logically lose “across”; “the enclosure here at the entrance” is sharper as “the enclosure at the entrance”; and “the mountains that stretch all the way to Alaska” begs to be reduced to “the mountains that stretch to Alaska,” for various rhythmic reasons. These are perhaps petty and personal concerns, but nonetheless such a critique can be levelled at many of the pieces. Moreover, there are instances when the shift from direct to elevated language is perhaps a notch overdone. In “Voyager,” our jettison of cultural tokens into space is described as “the fossil of our existence,” in which we are preserved as “surprised as the citizens of Pompeii.” “This is a population of phantoms,” reads the final line (or whisper…) of “While You Are Away at School,” describing a basement of insects, spiders and centipedes. These examples (among others) go over the top to create a sense of gravitas, breaking too widely from the overriding immediacy of the language to prove effective. Returning to the issue of poems included because of thematic or projecty concerns, I found myself often wishing for Andrusyshyn to push further, to resist the urge to end her poems where she does and arrive somewhere unexpected. Too many poems, in simply describing something or making an observation, stop too soon for any emotional or intellectual payoff. I am wanting, along with Donald Barthelme, for literature to break my heart; but heartbreak can also be intelligent, and difficult, and resistant. Go further, I found myself scrawling beneath last lines, missing a sense of revelation and discovery, or, sometimes, even purpose. The purpose is, upon reflection, quite clear: the insufficient poem holds up the roof of the concept, the project, the theme. These are the worker drones of the story’s hive mind; we recognize their purpose via the totalizing narrative. Withdrawal from the book and isolation in the harsh fields of, say, a literary magazine would diminish their strength considerably. The problem with a project is that there may be only so many ideas one can execute with true excellence—the threat is the filler, the trivial, the just because. For example, while The Hayflick Limit is certainly apropos of Andrusyshyn’s concerns, the poem “The Hayflick Limit” is a poor cousin to Matthew Tierney’s wonderful Coach House collection of the same name. The poem “The Grizzly Man” is, I believe, entirely unnecessary in the wake of Werner Herzog’s film on the same subject, Grizzly Man. Arguing this contentious point is tricky because I would have to provide you with poems in their entirety to make myself perfectly clear. If the book is in your hands, I am thinking of “Roy, Central Park Zoo,” “No Mammoth Is an Island” and “The Reno Balloon Dance,” to name a few. But let’s stop there and dwell in something marvellous. hiding oranges in early man’s fire pit. There’s something haunting and achingly sad about this discovery. At the very least, her father is trapped behind glass, a specimen, studied and gawked at in all his naked and savage glory. He is pathetic and vulnerable, stripped of the upright and rational brain he enjoyed in life. As a mannequin—and in death—he is without agency: he is a figure, representative of the unnamable multitudes that have come before. But he is also only transitionally locked into the narrator’s memory, which will fade, and corrupt, and eventually lose him for the second time. “He can’t help himself, keeps his place here, / collects oranges but never eats them,” the speaker says, observing the departed locked into a cycle of behaviour, frozen in an unbearable moment. “You can’t bring them back you know,” the mannequin reminds us, speaking of the bright fruit he buries in the pit. “I know,” replies the narrator, and we know what she’s really admitting, and what those oranges truly represent: the limits of what she can carry in the heart, or head, or homunculus skull; that soft spot inside us that keeps our extinctions alive. We stare into the blank eye of a mannequin and see our father, all our fathers, the snowy tundra of ancient Ukraine, the blackest and coldest reaches of space. It all recedes into distance, into unknowing, into some future inscrutable horizon that we can only squint toward with trepidation and a sense of blinding humility. Andrusyshyn pushes us to the edge of these questions, the places our composure threatens to collapse, and in doing so creates a marvellous, quiet and moving moment, in a book of many such moments, where answers are never easy and “the questions and avoidance, inexhaustible” (“The Bypass”).